We are closing in on 20 years since the cult classic comedy, Super Troopers graced our screens – 17 years and 3 months but who’s counting – and it has been worth the wait. 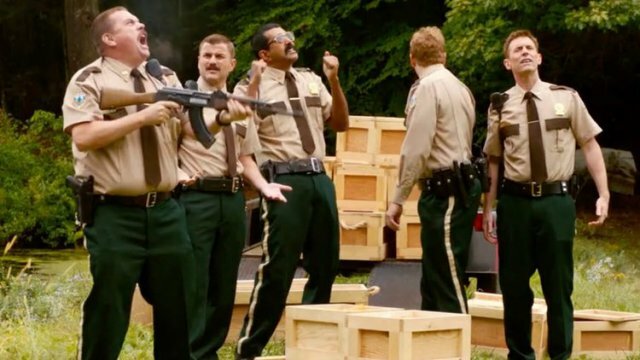 Super Troopers 2 manages to bring back the whole Broken Lizards gang, and a few others from the first movie, getting them mixed up in some (barely) international shenanigans that will leave you satisfied and smiling. The film picks up an undisclosed amount of time after the first one ended. If you remember *spoiler alert* the first film left off with the fellas bringing justice to the corrupt officers of the Spurbury Police Department. Unfortunately, this wasn’t enough for the Vermont Highway Patrol to not become a victim of budget cuts, but they do get to take over as officers of the Spurbury Police Department enabling them to keep their hilarious hijinks going. Their stint as Spurbury officers was ill-fated and due to some mysterious “Fred Savage Incident” they were all fired. Rabbit (Erik Stolhanske), Mac (Steve Lemme), and Farva (Kevin Heffernan) are now working construction – with Farva being the construction manager and getting a kick out of bossing the other two around and playing with his caulk. Thorny (Jay Chandrasekhar) has embraced becoming a woodsman - cutting down trees, growing a giant beard, and being one with nature. Foster (Paul Soter) ended up marrying Ursula (Marisa Coughlan), who is now the Spurbury Police Chief. The gang is getting back together to go across the border into Canada and meet Captain O'Hagan (Brian Cox) for a fishing trip. Well, it turns out that the Captain has a little more in store for them than just a fishing trip. There is some nonsensical reason having to do with a mix-up in our country’s border that leads to the U.S. absorbing a Canadian town. Captain O’Hagan has negotiated that the Vermont Highway Patrol be resurrected to oversee the transfer of power from the local Mounties to the U.S. Police force. Of course, things don’t go as swimmingly as everyone would have hoped and a ton of hilarity ensues. Following the blueprint of Super Troopers, the entire Broken Lizard crew penned the script with Jay Chandrasekhar directing. These guys know each other’s strengths and how to play their characters off of one another. Super Troopers 2 is chalk full of cameos including Sean William Scott, Damon Wayans Jr., and of course, Jim Gaffigan. Some hilarious performances from Rob Lowe, Emmanuelle Chriqui, and Will Sasso – who all play various authority figures from the Great White North – also bolster the film. There is nothing intellectually stimulating about the movie, and it is better off that way. Just like the first one, it is about a group of ridiculous State Troopers that act a fool. Broken Lizard found a formula that works for them and I couldn’t be happier that they stuck to it for Super Troopers 2. 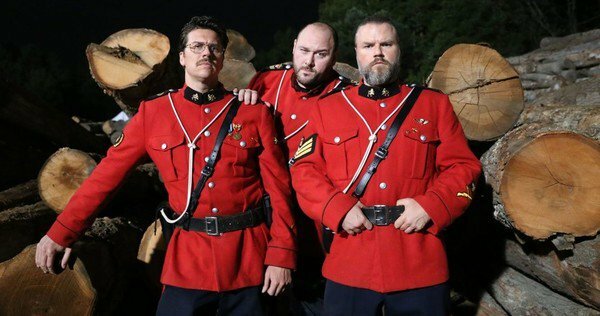 South Park already proved that a comedy can be based around making fun of Canadians and be hilarious, and Super Troopers 2 just hammers home that same sentiment. If you enjoyed Super Troopers than you should go to the theaters, grab some popcorn, turn off your brain, and watch the ridiculous ride that is Super Troopers 2 – you’ll thank me later.